Iranian student activist and dissident Ahmad Betebi was sentenced to death and severely tortured for years in the notorious Evin Prison in Iran. He escaped safely to the United States in late June. During a break from prison, Batebi fled Iran traveling through a free Iraq to Austria and finally arriving in Washington DC. 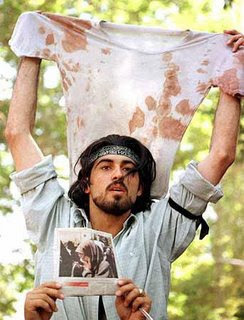 During his studies at the University of Tehran Batebi gained international fame for his appearance on the July 17, 1999 cover of The Economist magazine, holding up a shirt splattered with the blood of a fellow protester. Ahmad Batebi arrived in the United States in 2008 after years of torture and imprisonment. Today Ahmad Batebi and six other former Iranian student prisoners wrote a letter to President Obama. They urged him to support the democratic movement of the Iranian people. We congratulate you and the American people on your election as the 44Th president of the United States. Your historic victory is cause for celebration for those who seek freedom and equality around the world. It is a triumph of democratic values and equal rights, a vindication for those around the world at the forefront of the struggle for civil rights. The democratic institutions that enabled you, an African American, to become the highest ranking official in your country has awed people around the world. As you noted in your inauguration speech, the fact that the child of a man who, 60 years ago, may not have been permitted to enter a restaurant because of the color of his skin is now serving as leader of the nation, is testimony to the sacrifices of so many others during the painstaking historic progress of your land. Mr. President, you ran your campaign on a promise of change, for both American domestic and foreign policies. Regarding your administration’s policy to Iran, you stressed the need for open and direct dialogue. As you know, Iranians are in the midst of a courageous fight for their most basic freedoms. The democratic movement in Iran, led by students, women’s rights activists, workers and human rights defenders, is violently repressed by the regime. The Iranian people, a majority of whom live in poverty despite their country’s natural resources, seek to determine their own destiny. They form a resilient base of support for the civic groups calling for a democratic Iran, respectful of the human rights of all Iranians. The political structure of the Islamic Republic monopolizes power in the hands of one almighty Supreme Leader, a cleric appointed to lead for life. The system does not allow for peaceful change through legal means. The function of the president is reserved for Muslim Shi’a men, and only those among them who believe in the theocracy are elected through a process marred with fraud.. The president, whose function is merely administrative, implements the leader’s decisions and is unaccountable to the Iranian people. We former student activists wish to address you as a progressive social reformer. In your policy making regarding Iran, you will contend with the whole gamut of ways Iran is a problem for the US: from the regime’s nuclear ambitions to its regional influence and support for terrorism around the world. We call on you to pay special attention to the repressive, unaccountable nature of the regime that creates these problems and to keep focus on the Iranian people’s demands for democracy and human rights. As the president of the United States of America, you must defend the interests of your country. We are certain you know that in this increasingly interconnected world, the long-term interests of your country can never be fully secured when others in foreign lands do not enjoy freedom. Mr. President, you marked your first day in the White House by ordering the closure of the Guantanamo Bay prison. But in our country, many Guantanamo exist, only our Guantanamo are home to students, women’s rights activists, labor organizers, political activists, and journalists. We, as former student activists who spent time in Iranian prisons under inhumane conditions, call on you and all those who defend human rights, freedom and equality to express solidarity to the people of Iran as they wage their struggle for freedom. – Akbar Atri, BA in Political Science from Alameh Tabataba’i University and MA in Political Theory from Mofid University in Qom University; member of the executive committee of Daftar Tahkim-e Vahdat, the umbrella group for Islamic student associations in Iran. He was tried and sentenced to seven years in prison by the Islamic Revolutionary Court for his pro-democracy activities. –Ahmad Batebi, BA in Social Sciences from Payam Noor University and former member of Jebheye Motahed Daneshjoo’I (a secular student group). He was arrested during the July 1999 students protest and sentenced to death. His sentence was reduced to 15 years in prison. – Farzad Hamidi, MD from Oroumieh University. Former student activist member of the Iran Demorcratic Front, he was arrested several times and spent three years in prison. – Hamid Alizadeh, MD from Tehran University and former member of Jebheye Motahed Daneshjoo’I (a secular student group). He was arrested during the July 1999 student protests and spent one year in prison. – Kianoosh Sanjari, student of Art in Sama University of Sari and member of Jebheye Motahed Daneshjoo’I (a secular student group). He was banned from university because of his pro-democracy activities. He was arrested 9 times and spent two years in prison. – Koorosh Sehati, student of Agricultural Engineering and member of Jebheye Motahed Daneshjoo’I (a secular student group). He was a student activist during the July 9, 1999 student demonstrations. He was banned from university and spent two years in prison for his pro-democracy activities. –Manouchehr Mohammadi, student of Economy in Tehran University and Head of Ettehadieh Melli Daneshjooyan va Faregh ol Tahsilan (a secular student association). He was expelled from the university for his pro-democratic activities and arrested during the 1999 student protest and sentenced to 15 years in prison. He fled from prison after 8 years of incarceration. Unfortunately, this letter will most likely get tossed. The Obama Administration is set on holding meetings with and propping up the terrible regime. The suffering of the Iranian people is not a priority to this Administration. I hope I can later eat these words. Sadly, I don’t believe that will be the case. BREAKING: Iran’s Most Famous Political Dissident Escapes to United States!